How New Orleans Charter Schools have become the Global Model for the Community Education Agenda …New Orleans is… the nation’s first and only all-charter school district, the Recovery School District [RSD]. The system of charter schools, which are run by private groups instead of a publicly-elected board….RSD focuses less on the ABC’s and more on holistic child development, including topics like socialization, independence, self-control, communication skills and accepting responsibility. PARENTS BEWARE of the PUBLIC ONLINE HOME STUDY PROGRAMS! This is NOT home schooling. This is the government ideology but without oversight of what your children are learning. Every Christian parent being lured to a charter school by “free” services and money must seriously consider and understand the long-term consequences of his or her decision. [Parents, when we choose these government run programs,] not only can we affect the worldview of our children, we can have an adverse impact on those who are attempting to gain full freedom in the teaching of God’s word for their home-school. 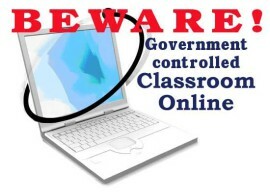 While there are many great online courses to help supplement home school studies, Online courses made available by the government run system means there are no printed textbooks, no printed assignments, no printed tests or assessments. So, parents may never know what their children are being taught unless you sit with them constantly while they are using this resource. Taking away the “moral compass” of the trained classroom teacher and replacing with online studies is crucial in moving towards the total state controlled indoctrination of our nation’s children. Charter schools have been relentlessly marketed to the American populace as a silver bullet for “failed” public schools, especially in poor urban communities of African-American and Latino/a students. Politicians in both parties speak glowingly of these schools — which, by the way, their children seem never to attend. Opening charter schools has become the latest fad for celebrities including athletes and rap stars. Huge nationwide chains — called education management organizations (EMOs) — now run many of these charters. more…. The Supreme Court’s recent 5-4 decision allowing the constitutionality of financial aid to parents which they may use at religious or private schools, including virtual academy (computer-assisted-instruction) charter schools available to home schoolers, will result in the deliberate dumbing down of all education. Some charter school administrators have claimed that since parents are not employees of the charter school, parents can provide and use their own Christian curriculum. These administrators usually suggest that the parent not report any religious books being used, and not have their children make any references to religious doctrine, or Scripture, or Christ in any assignments being turned in. What does this teach children? It teaches them to lie. (Luke 17:1-2) It teaches them a utilitarian mindset–that the ends justify the means. It teaches them to keep quiet about their belief in God and His Word and their hope of salvation in Jesus Christ when it suits their financial interests and convenience. On the other hand, using materials based on a worldview that isn’t biblical teaches children to compartmentalize their life and to be dualistic in their worldview–to believe that God’s Word does not speak to every area of life. Charter Board Partners – D.C. Organization Partners with Teach for America – Obama’s teacher corps to train “master teachers” or “facilitators” to replace current certified teachers who aren’t willing to teach the global curriculum promoted by UNESCO. Read this article to understand the truth behind the Teach for America program. Charter schools have their own rules for teacher qualifications. The laws for charter schools have allowed the contracts for many charter schools to not require certified teachers of instruction in a specific field of study. With the goal of computer/online learning, “facilitators” are all that are needed and Teach for America’s 5-week course trains the facilitators. Fethullah Gulen, allegedly “the most dangerous Islamist on planet earth,” is alive, well, and living in Pennsylvania with over $25 billion in financial assets. From Pennsylvania, he has toppled the secular government of Turkey, established over 3,000 schools throughout Central Asia, the Middle East, Europe, and the United States, created a new country called East Turkistan, and formed a movement that seeks to create a New Islamic World Order. A partial listing of the Gulen schools throughout the U.S.A. is listed in this article. Parents need to be aware that their child’s “science academy” my be teaching their child the Islamic culture.